So I have a couple Roland sound modules (MT-32 and SC-8820) and would like to create full soundtrack libraries for a few Sierra classics with them. I have the modules set up to my computer through an interface (a Behringer 404) and honestly, they sound really good as they are. But before I commit to the painstaking process of creating a large set of immutable audio files, I would like to ensure I'm getting the best quality sound I can out of them, in case there's any more I can do. In other words, I'm taking on this project pretty seriously. But my passion aside, I don't really know what I'm doing. The results I'm getting from the MT-32 are sounding pretty much the same as clips of a few tracks I'm finding online. If that's the best I can expect, I can accept that. However, if I could improve it, I might as well, and now is the time to ask. For one, I noticed many of the tracks from Quest Studios often have extra musical embellishments I can't find in the resource files, but overall that's not a priority. I am especially curious how they enhanced the overall sound quality though because it sounds really good. However, if this requires a different module then that's probably not worth it. The more complex case is the SC-8820, since I don't know of any simple equal comparisons online like I did with the MT-32. Moreover, I have some doubts all is right with how it currently sounds anyway. A long time ago, I recorded one track with it on my old computer before I even had an interface. I think I just hooked a 3mm from the headphone jack to the line-in back then. Whatever I did, I preserved the file and you can listen to it here. But on my new setup with a Roland cable connected to the interface, it now sounds like this. Very similar and still pretty good, but in my opinion not quite as good, so now I'm wondering what the heck I was doing before, and if there's some subtle change I put in before that would improve it now. So if there are any experts out there that could advise me on how to best perfect all the audio I'm recording, whether it's a setting on the device somewhere or I need to edit MIDI files before recording or audio files after recording or whatever, I would much appreciate it. In my opinion, your "new" recording is better. The old one sounds thinner to me. The new one sounds like there's more dynamic range. The swells sound better to me. The "flatter" sound in the sustained parts your new recording cold be byproduct of this and solved easily with some very light compression and a little EQ. I'd go so far as to say, what you need there is a little reduction in the middle frequencies like the 1000hz area to pop your high and lows up a bit more. EDIT: I'd also say that when going from recording something using a lower quality interface to better equipment is not unlike photography. You get a more "reference" image. But you have more to work with. You have to develop the photo a little before you print it. Do you record "straight through"? IE: play the Game/MIDI and record the audio from all synths at once. Is the intent really archiving/purity of the original material, or allowing embellishment? Unfortunately, there is a lot of open-ended and/or very subjective answers to your questions. As you mentioned, without original sources and knowledge of specific recording setup it's almost impossible to say with certainty how some things were done. As it relates to the QuestStudios soundtrack recordings: Some hardware changed over the years as Tom was doing it (he went from older to newer Sound Canvases), but essentially they were all done basically the same. Almost all of the soundtracks are doubled one way or another with MT-32 + Sound Canvas. That is the predominant sound/style used there. Connect to whatever is likely the highest quality output connector available on the device. For the Sound Canvas' it's RCA -> TS again into two of the mixer's TRS inputs. I also have all this connected to my Motu 24I/O. So in some instances I have synths connected directly to that where I am able to Multitrack each synth individually instead of everything coming on one stereo pair from the Mixer. Volume/Headroom/Noise Floor (Critical) -Applies to any recording input, mixer or otherwise. This is where you have to make some adjustments either from experience with your gear and/or each song. You want the volume as high as possible to throw out the noise floor. Set the "master" volume of the device as high as possible as long as it's not clipping. This should be done everywhere down the chain where volume is adjustable. I usually record everything 24bit 96khz. Recording / Pre-Recording in real-time - what I would call "Hybrid Recording"
I usually record inside of FL Studio, where I am able to use all the tools available there. Inside FL I also still have access to the MIDI devices as they are playing even if the MIDI itself is playing from my ancient version of Cakewalk Studio, or Media Player, DOSBox, or ScummVM!. Sometimes my recording and midi source tracks are entirely inside FL Studio. Sometimes, not, it doesn't matter. Very flexible this way. If I want to add/change anything to the song, I have total freedom and do it all in real-time and just hit play. Once the song is "done", I make my final tweaks to master compression and EQ. Then I make my "final", or in most cases first actual recording from this point. Everything prior has merely been real-time playback and adjustments. This all, of course, is just my opinions, and how I historically do things for myself. Anyway, I hope this is helpful for you! Andrew probably would have noticed and said so, but it may be that the Instrument Map (set by the front "INST MAP" button on the SC-8820) had previously been set to the SC-55 Map. The way the horn is well-defined on both versions at the 2 second mark makes me doubt it, though. Andrew is probably correct in that the impedance was mismatched before, which can cause highs to roll off as muddy. That's kind of what it sounds like to me, but I'm no expert. A further idea for improving the recording, which I don't think was mentioned, is that minor noise may be caused through playback using the virtual midi (USB) interface builtin to the SC-8850 (it should also apply to the SC-8820), while using its real MIDI input shouldn't (due to how MIDI inputs/outputs are standardized not have ground loop issues). Of course, then for the SC-8820 you'd need its external wall-wart to power it. I compared each once because someone mentioned it on a forum for their recording. Sure enough, I heard a difference so I would choose to make recordings using the real midi inputs, although sometimes I'm too lazy or in a hurry. Even USB MIDI interface outputs to a module's MIDI input will break ground loops because of MIDI's excellent current-loop design. Really, though, unless I'm making a side-by-side comparison, it's hard for me to tell. I play music using the builtin USB virtual MIDI all the time. Good luck! These projects can be fun. Hey Andrew, thanks for the lengthy reply! I have a lot to explore here. Interesting you find the new recording to be better. I won't debate you on that point, I'm sure your ears and equipment are overall better than mine. I suppose a better way to put it is that I feel the old recording did more with less and the new recording does less with more, which is consistent with your comment about photo development. But it sounds like there's no reason to pay any attention to the old recording at this point. Considering your own preference, my skill level, and the number of tracks I'll need to record, I'll go with option 1 as well. One use of the recordings will be to accompany videos of game footage. I don't need to go into the reasons I prefer separate recordings over live capture here, but suffice it to say there is a motive to keep the recordings reasonably faithful to live play. However, I'm not opposed to embellishment, philosophically speaking, and would probably prefer it if possible. My main concern is simply that I will be bad at it. It seems the more straightforward and technical something is in this field, the more confident I am in my ability to execute it, and the more subjective it is, the greater the likelihood I'll just move everything in the wrong direction, not notice something that needs attention, or not know how to fix it. You can tell this is true just from the fact I couldn't identify which of my recordings was better, heh. I'm using Roland cables that seem to be created for this job, so I assume they're good enough. What do you mean by "unbalanced"? So I don't actually have a mixer, and perhaps this gives away what an amateur I am. I suppose my mindset was to just try to copy the module output straight to the computer as simply as possible, in the spirit of keeping things straight technical as mentioned earlier. So what all am I missing out on without the mixer? Can similar effects be applied through the DAW? I guess it's a given it will be less desirable at the very least, but I don't know to what degree. So there's the volume on the module itself and the two ports on the interface... is there anything else besides a hypothetical mixer? How do I ensure the volume isn't clipping on the module itself? I was previously avoiding clipping on the interface, but now it occurs to me that may not be enough if I was technically testing the two devices in combination. My mindset was that I needed to figure out a single volume setting and try my best to leave it there for an entire soundtrack. I figured the composer already optimized relative volume settings within a soundtrack, but now that I think about it that's probably not right since every module is different after all. There's also the weird matter of two separate TRS ports in the interface for the stereo output. I figured whatever proper setting it should be, it would be the same for both. But it actually looks like I have to set the left side a bit higher than the right to balance out. Is that normal? I tried to accurately measure the two sides but my methods may have been flawed. I've been trying MuLab, but I don't know if my struggles can best be explained by the shortcomings of the program or me. It has always been cumbersome trying to import MIDI files into it. But what is the best practice for obtaining MIDI files, particularly from Sierra games, in the first place? I can rip straight out of the resource files using SCI Viewer, but I don't know if there's some other filter or processing or something the game does before playing the files that I would be missing. Plus, I don't know how to handle files whose looping points are part of the way through the file. Or I could record MIDI output using DOSBox, but that will have a bunch of extra MIDI data from other parts of the game that I don't want, and sometimes I wonder whether these output files are... stable, for lack of a better term. I think that's enough questions to dump on you for round 2. Thanks again for your help! Thanks Jaffa, I was indeed using the USB input for convenience, but if there is any kind of difference I might as well switch to MIDI. Neither the MT-32 or the SC-8820 supports it. Dealing with each module's stereo output, one at a time, with a stereo input should be perfectly fine without a mixer. Hardware mixers are often nice for monitoring audio levels before they reach the encoding/recording device, (and obviously for mixing disparate channels as one chooses into one or more output channels, or rerouting channels, etc, dependent on the mixer), but your usb soundcard may include an input level-monitoring virtual mixer, or your capture program probably does, and windows' builtin mixer should too. You just don't want distortion when recording, so levels should be not going above zero decibels, which is probably shown as red in the mixer's live input monitoring. Other than that instance, I don't think Roland sound modules, themselves, distort internally. At least I've not noticed any. The module a soundtrack was designed for is probably more consistent across different units than you'd imagine. Different MIDI module manufacturers did have different instrument volumes, but if a soundtrack was designed around a given Roland sound module, the relative volumes heard/captured is what the composer decided to standardize it on. Of course the volume knobs and parameters can change it. In the case of the MT-32 it's probably best to not touch it, and let the soundtrack program the volume itself (as most do upon loading the SysEx). Then, just base your interface's input level on the maximum levels your interface is receiving. For the SC-8820, I'd leave the volume knob on its front turned up all the way, and again fit the interface's input level to just below clipping for the loudest parts. It's just my opinion, but I'd probably also leave the input volume the same throughout a whole soundtrack because it makes more sense to me to preserve each track's relative volume. (And to do that, if amplifying later, I'd apply 0 dB peak amplification across the whole soundtrack, before splitting the tracks into separate songs). You may want to try recording one channel (left or right) from the sound module using each input (ie. left, then right) and compare the recorded volumes. If you import or record one channel into Audacity, then in the "Effect"->"Amplify" menu/tool you can see the level the selected track would need to be increased to be at 0 dB Peak Amplitude, by default in the text box next to "Amplification (dB):" Write the value down, then you could delete that track (or create a new one and select it) to record/load the other soundcard input channel (from the same sound module output channel as last time) and get an amplification value for it. If they are the same, you've set each equally. Otherwise you'll want to tweak them until they are. You may also find audacity's input level monitoring useful (right of the microphone image at the top, you can "click to start monitoring"). I don't know much about SCI Viewer, but I tried using it with Larry 5 to first hear its CM-* drum effect sounds. I had used it to export the MT-32 MIDI tracks but don't think they include the startup SysEx and that must be loaded first, to program the instruments. You can record this SysEx into a midi file just by using a sequencer to record with and running the game's startup (say, from dosbox, as you suggest). And that brings me to another point: Larry 5 initializes the "System Temp Area (rhythm part)" to the MT-32's defaults at startup when using the original game's 1.pat file. NewRisingSun created an alternative 1.pat which initializes it to the LAPC-I/CM-32L's rhythm defaults, so that the originally programmed, but previously unrealized, CM-* sounds can now be heard in-game. Due to that particular game's release date, etc., I doubt other games meet these perfect complicating conditions. So it is possible SCI Viewer's export will differ from the game's audio experience. Anyway, I'd probably record from the actual game to have the most faithful playback (perfectly as setup from the game). Also, in the game's install program (in dosbox or real dos) you can probably set the sound effects to use another device such as sound blaster (or turn them off) so you won't have to worry about them playing on the MIDI module and recording them if you don't wish to. Using that method you also should be sure your gameplay computer (or dosbox) is running at a sufficient rate so that you don't have temporarily-stuck notes or abnormal pauses while playing music, but nowadays computers are generally fast enough for even emulated games through dosbox. Instead, you might have success by playing the intro SysEx from Tom's soundtrack, pausing/stopping that, and then playing an exported (and looped or whatever you think is required) SCI Viewer MIDI file. It covers how to capture the MIDI data reliably as standard MIDI file format, so it doesn't illustrate what you're intending as output, but it may be useful for your first step. Sorry to resurrect this for something that probably no one notices or cares about, but I'd forgotten to mention a possible (but hopefully inaudible/pedantic) issue I'd planned to circumvent myself, if recording the MT-32 or CM-64 with intended perfection. That is, the output impedance from those sound modules may be geared for bridging into professional (ie. guitar) amplifiers and not audio interfaces. In 2013, I made a note to myself that the MT-32 Real World Interfaces modification (available at https://www.vogons.org/viewtopic.php?t=34205) says that the MT-32 has an "effective" output impedance of 6.8K Ohms (6800 Ohms). Although the MT-32's impedance may be known (that was the only place could find it), information on computer recording interfaces rarely includes an input impedance in the specifications. Of course most interfaces have line level inputs, and (from https://en.wikipedia.org/wiki/Line_level#Impedances) line level is typically "10 kΩ or more" impedance. Anyway, if wikipedia is consulted for impedance bridging ratios too (https://en.wikipedia.org/wiki/DI_unit#Passive_units), it appears that 10:1-20:1 (input:output impedance) is standard practice. That should mean that to get optimal high frequencies from the MT-32, one needs 68000-136000 Ohms (or more) as the input impedance, and line level's input impedance probably won't be high enough. A 2-channel (or couple) direct injection ("DI") box(es) with a high enough input impedance could be used to solve that. Of course, they would output the audio (balanced, but as mentioned before, fine to convert to unbalanced) on 2 XLR connectors (which can be adapted to 1/4" plugs, but it would still be at "mic level" not line level), so it's an all-around expensive ordeal, and probably not worth it to most. I have two Samson "S direct plus" DI boxes (which have, in their guitar mode, one Mega Ohm input impedance) that I, someday, intend to use with the MT-32 and CM-64. It will be quite an elaborate recording setup (especially since I don't have 4 XLR inputs on my soundcard, but I do have a mixer and some other equipment that converts mic level into line level to make up for it). More importantly, I'm perfectly happy, and quite used to, just listening to the (probably imperfect) audio directly through my mixer and stereo. It's these synthesizer's low frequencies (which should be unaffected) that I really enjoy anyway. 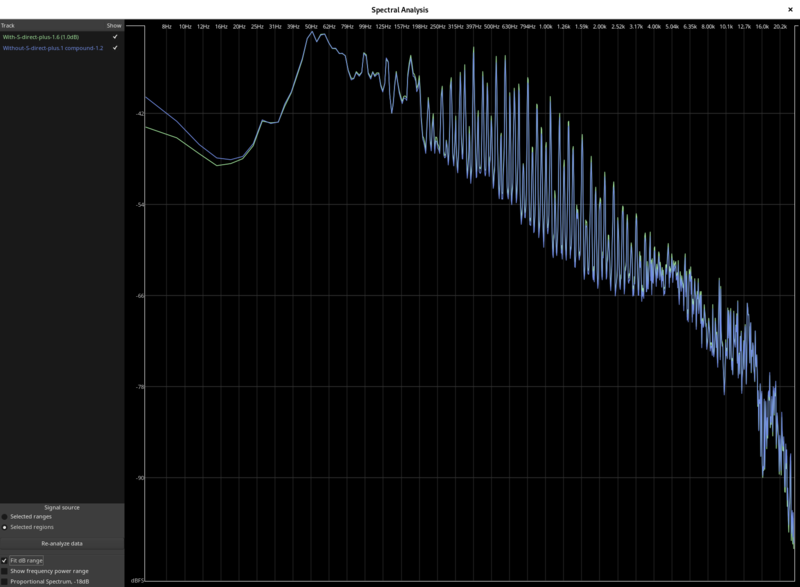 My speakers, surely, don't have a flat frequency response either. Sorry to reply about this so late, but I doubt anyone would hear (or desire) the difference it will, theoretically, make. I was just reading what I'd written before, and realized I hadn't mentioned it. After the post yesterday, I couldn't help myself and decided to see how defined the difference would be. It turns out to be pretty minor, to my ears, but I also captured screenshots of spectrum analysis and "Loudness Analysis". I used ardour 5 on debian GNU/Linux to do the captures, and captured at 48 kHz, 24-bit. I just used the queststudios sequenced Silpheed soundtrack, since I thought its bells might make higher-frequency differences apparent. I think it shows that there's a subtle difference in volume across the frequency spectrum. The midrange frequencies seem to be a smidgen louder, while the extreme ends of the spectrum are a little quieter. I'm not positive it's due to the higher-impedance inputs, or to my mixer's mic preamps, though. I used a behringer XENYX 1202 mixer for both captures. It's possible that the mic preamps don't have a truly flat frequency response, even with all the EQ knobs set to 0 (their midpoints). I just don't know without more testing.